Optimum Security is a full-service security provider which offers a complete range of customizable private security solutions to homeowners, businesses, and organizations in Victoria. We take pride in improving the safety of the people and assets we are hired to protect, and we use the latest in advanced technology, security procedures, and ongoing training to ensure your complete satisfaction with our services. 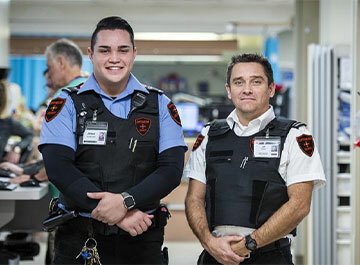 As the preferred security partner among discerning individuals and companies throughout BC and Alberta, we carefully screen and supervise every member of our uniformed security guard team to ensure they meet the high standards of Optimum Security. Our uniformed security guards are all fully licensed and insured, and have undergone extensive background checks and rigorous screening. Optimum Security guards have additional training in loss prevention, communication, surveillance, and emergency response that exceeds government standards. Our mobile patrol services are available to help keep your property protected 24 hours a day, 7 days a week. We operate clean, well-marked security vehicles equipped with advanced GPS technology to assist with site protection, surveillance, and risk management. We help contractors, homeowners, and commercial property owners who want to minimize the risk of theft, vandalism, and unauthorized entry. Our security specialists can review your specific needs, and develop a security plan that includes random mobile patrols, regularly-scheduled mobile checks, or a combination of both services. To learn more about how we can help identify and mitigate security issues at your Victoria home, organization, or business, contact us at Optimum Security to schedule your complimentary security consultation today.